Click on the map below to find out the details in your location. If your town is included, an activity is planned or has concluded. If you you have a report on a completed activity and it is not yet on the list, email us with the details so they can be published. The Adelaide ceremony was held at Boer War Memorial Cnr King William Road And North Terrace. HORSES The Barossa Light Horses Mounted in full uniform. DOGS The Newfoundland Dogs. In respect to NELSON the South Aussie mascot with a wonderful history. CAR PARKING !!!! Torrens Parade Ground was secured for this event. Further information will be advised shortly. Boer War Day 2014 was held at ANZAC Square in Brisbane at 10:00hrs Saturday 31st May, 2014. Ceremony included an address by the CO 2/14 LH (QMI) LTCOL Ash Collingburn, a Catafalque Party from the 2/14 LH (QMI) and 2 Horsemen in Boer War rig from the QMI Historical Horse Troop. Theme will be the Battle of Mokari Drift where Lieutenant Caskey was killed. Presentation of an original letter dated Sep 1901 about the death of Lieutenant "Jack" Caskey to the CO 2/14 LH (QMI) on behalf of the Light Horse Museum Enoggera. 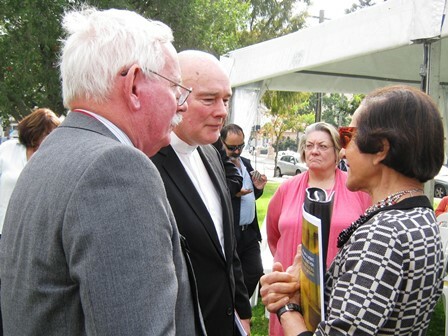 On Saturday 31 May 2014 at 14:00 hr, the Reverend Paul Black and the ACT NBWM Committee conducted the third yearly commemorative service at Saint John the Baptist Anglican Church, Reid which is located directly behind the NBWM site on ANZAC Parade. This service is to pay tribute to all Boer War Veterans who served in the conflict to express "Praising what is lost - makes the remembrance dear". It is also to specifically remember two local volunteers who are commemorated at the church - Sergeant William Bradshaw Galliard Smith of the 2nd Scottish Horse who was the second son of the Reverend Pierce Galliard Smith MA, Minister of St John the Baptist's Church for thirty -one years. He was killed heroically at the Battle of Brakenlaagte on 30 October 1901 and Private William Frederik Young of the 1st Australian Horse who died of disease at St Vincent's Hospital Sydney. He had been wounded in South Africa and contracted enteric fever. The service was attended by Senator the Honorable Kate Lundy, Senator for the Australian Capital Territory who read Boer War Day 2014 Message from His Excellency General Sir Peter Cosgrove, AK , MC (Retired) Governor - General of the Commonwealth of Australia and also laid flowers on the grave of Private William Frederik Young. Mr Nigel Webster, Chairman of the ACT Branch of the NBWM Association was the Master of Ceremonies and gave a welcome address to those present. Mr. Phillip Chalker, President of the Australian Light Horse Association who attended in period uniform and mounted greeted those attending at the entrance to the church which provided great period atmosphere. The Hon Gai Brodtmann MP, Member for Canberra gave a moving commemorative address which focused on local service in the South African War. 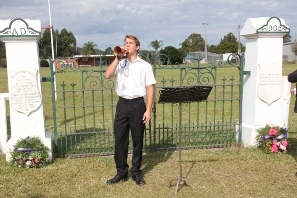 Lieutenant Liam Fuller, B Squadron, 1st/15th Royal New South Wales read the Boer war Day Message 2014 from General D.J. Hurley, AC, DSC Chief of the Defence Force. Mr Carlo Vlok, Chairperson of the South African Military Veterans of Australia (SAMVOA) ACT Branch read the 23rd Psalm and Dr J.V. Johnson, CSC, AAM RFD, ED, Chairperson of the ACT Reserve Forces Day Council movingly read 'The Recessional' written by Rudyard Kipling in 1897. During the Service and at the graveside Sgt Jim Davey, 5th Engineer Regiment played the pipes and the traditional Boer tune 'Sarie Marais" was played at the church for the first time. An increased number of descendants attended this year including Mrs Adrienne Bradley, a direct descendant of Sergeant William Bradshaw Galliard Smith and Mrs Betsey Boundy, the daughter of Sergeant Henry Clifton Prosser, Fourth South Australian Imperial Bushmen was present and who is a parishioner of Saint John the Baptist Anglican Church. Mrs Trish Barnes and her mother Mrs Joyce Greenway also attended being the descendents of Trooper Ashley Whitney of the then New South Wales Lancers. Representatives of the South African Military Veterans of Australia (SAMVOA) ACT Branch attended for the first time and were most welcome. Lieutenant Liam Fuller of the Canberra based 1/15th Royal New South Wales Lancers represented the Fighting 29, from his Regiment, the first Australian uniformed soldiers to be in action at Belmont south of Kimberley South Africa on 23 November 1899. Floral tributes and wreaths were laid on the altar of the church and the grave of Private William Frederik Young. An informal and enjoyable afternoon tea was held at the Parish meeting room after the service which produced many interesting anecdotes about the service of ancestors by the descendents present. 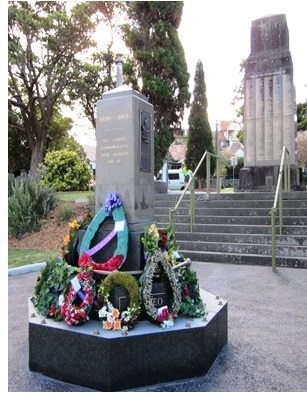 Clarence Town ANZAC Committee held a lovely service at the Boer War Memorial on the 25 May 2014. It is a very important day for us as we are one of the few in the area to have a Boer War Memorial. 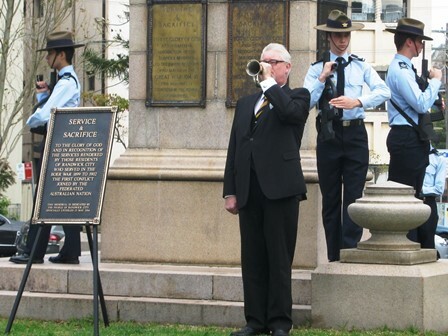 Gosford RSL Sub Branch conducted a commemoration service at the Gosford Boer War Memorial Friday 31 May, at 11am and it went well, This was the first ceremony conducted by the sub branch and the President stated that it would be repeated next year. Only a small number of people from Club representatives were present. Fr Rod Bower led prayers and national anthem. A highlight was two Henry Kendal High School students who have visited Anzac Cove and who researched and spoke on Boer War. A Goulburn Commemorative Ceremony was conducted at the Boer War Memorial in Belmore Park on Sunday 26 May at 11:00 hr. This was the second time that such a ceremony has been conducted in Goulburn, New South Wales. It was attended by approximately 35 people who gathered to pay tribute to the estimated 130 men of the Goulburn district who served in the Boer War. The weather was cold and windy but fortunately the rain held off until the ceremony was concluded. The ceremony was conducted in the vicinity of the Boer War Memorial which was unveiled on 14 November 1904 to commemorate those from the Goulburn and surrounding districts who served in the war and was paid for by public subscription. The memorial in Belmore Park records the names of seventy six local men of whom four died. 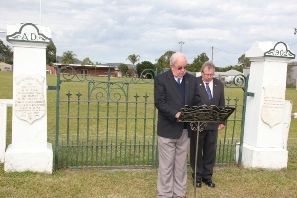 The ceremony was attended by a number of local dignitaries including the Mayor of Goulburn, Mr. Geoff Kettle and Mr. Angus Taylor MP, Member for Hume who read the Boer War Day 2014 Message from His Excellency General Sir Peter Cosgrove, AK, MC (Retired) Governor -General of the Commonwealth of Australia. Mr Carlo Vlok, Chairperson of the South African Military Veterans of Australia (SAMVOA) ACT Branch read the Ode to the fallen. Mr Nigel Webster, the Chairman of the ACT Branch of the NBWM Association was the Master of Ceremonies and gave the commemorative address which gave a history of Australia's first overseas military action as a nation and of the local men who fought valiantly in the South African war. He commented that the great majority of Australians served as front-line troops and over 90% of them did so as mounted infantrymen. Wreaths were laid by representatives of federal and local government, ex-service associations and descendents so the memorial was once again used for its intended purpose of remembrance of local military service in a hard fought war 112 years ago. Mr Gordon Wade, the RSL Goulburn Sub Branch President, was pleased with the turn out and conduct of the commemorative ceremony and this is now a scheduled event in the Goulburn calendar. The annual BOER WAR COMMEMORATIVE DAY held in Hobart Sunday at 12 noon, was deemed an outstanding success. 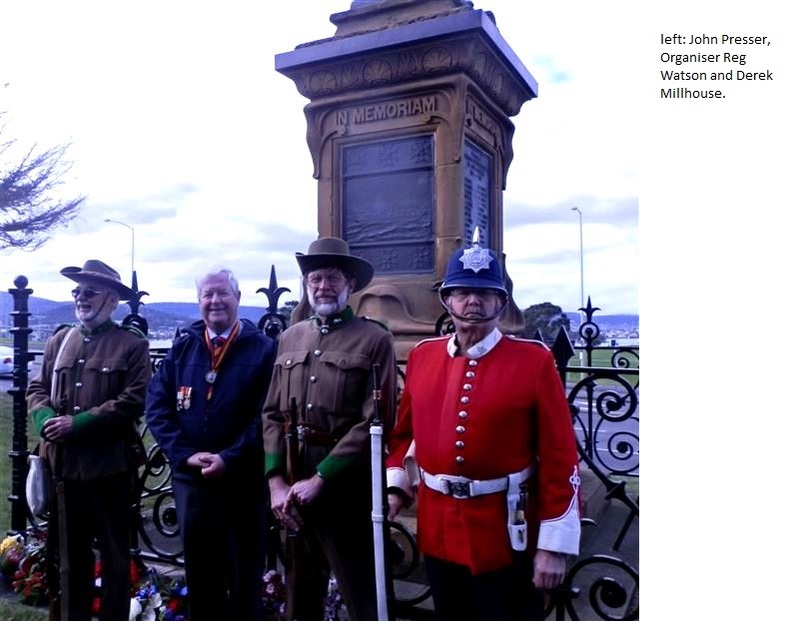 Organiser of the ceremony, Mr Reg Watson, said that there was a great turn out for the event which was held at the impressive Boer War Memorial, Domain. This was the eleventh time it had been held. "The Day is held in memory of those Tasmanian who served in that forgotten war so many years ago," he said. "Forty Tasmanian sons died as a result of their service and it is the aim to remember them." There was a good number of the public represented. The Clarence City Band played Edwardian airs which included the Tasmanian National Anthem (1896). The SSA Militaria Collectors Tasmanian Inc fired a volley a salute, while the 22nd Light Horse Association stood attention. Cadets saluted while wreaths were laid as the Lone Piper played a lament. Those laying wreaths included the Lord Mayor Hobart, Damon Thomas, Hon Elise Archer MHA on behalf of the Tasmanian Government and Hon Madeleine olgivlie on behalf of the Opposition. Mayors and Alderman also did. In his address Mr Watson reminded that it was 150 year anniversary of the birth of the Boer War Correspondent Banjo Paterson and that the first ever war correspondent, William Lambie who worked with The Mercury was killed serving his profession. "Lambie was on patrol with the Tasmanians when they were ambushed. Two Tasmanians were killed with him. Lambie is buried with the Tasmanians in South Africa," he said. The Anglo-Boer War was fought in South Africa (1899-1902). 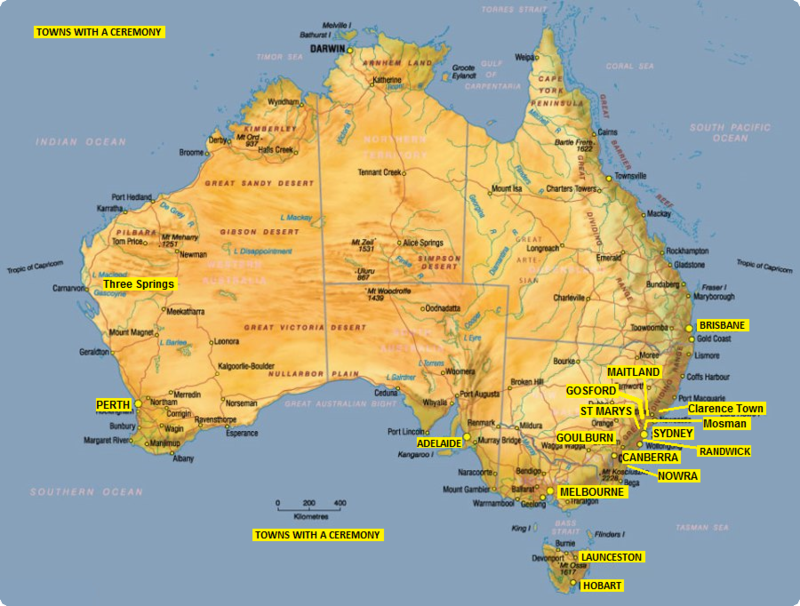 Tasmanian as an independent colony sent volunteers to the war and two Tasmanians were awarded Victoria Crosses. "I am very pleased with today's event," said Mr Watson. "Bigger things are planned for next year," he added. Excellent publicity. Good interviews on WIN TV News, Southern Cross News and ABC radio and tv. The impressive Boer War Memorial which stands in City Park Launceston saw the annual BOER WAR COMMEMORATIVE DAY held Sunday 1 June 2014 at 12 noon. The cadets mounted the catafalque and The City of Launceston RSL Band played Edwardian airs before and after the ceremony and during it, God Save the Queen and the National Anthem. Dr Frank Madill AM was MC for the ceremony while Lone Piper Craig Cooper of the RSL Pipes and Drums played when wreaths were laid, including those by the Mayor of Launceston Albert Van Zetten and representing the Premier of Tasmania, The Hon Guy Barnett MHA. Gary Fitzallen read Psalm 45 from the scriptures. Organiser of the event, Reg Watson during his address mentioned that this year was the 150th anniversary of the birth of Banjo Paterson and reminded all of the death of journalist William Lambie who, while "embedded" with the Tasmanians, was ambushed and killed during the war. making him the first of his profession to die in its service. Mr Watson went on to say that he would like to see a plaque erected in Lambie's memory as he also at one time worked as a journalist in Tasmania. Mr Watson also mentioned Mafeking, and read the message from the Governor-General Sir Peter Cosgrove. Fortunately the weather was good. Great appreciation was given to Terese and Wayne Binns who represented the Australian Light Horse Association. 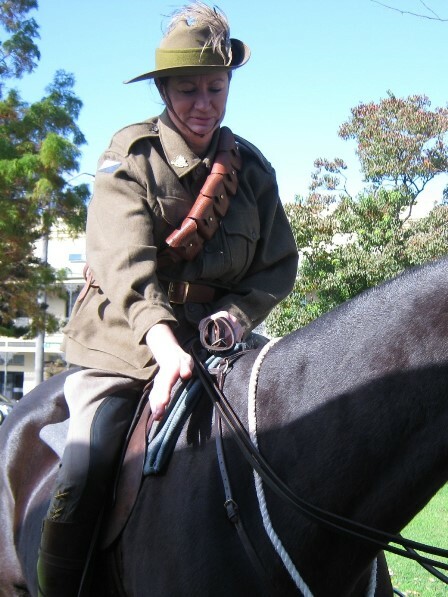 Terese wore a Tasmanian Boer War nurse's uniform. "The Memorial is in a tight corner of the City Park; nonetheless, our commemoration there is always a successful affair," said Reg Watson. Mr Watson took a media interview immediately afterwards with the ABC. "Discussions with those who participated took place about making a greater effort for 2015 to make it even better," he added. The Maitland RSL sub-branch held a combined memorial service on Saturday morning to honour those who served in the Boer War and in the Sandakan death marches. President Eric Bell said the Boer War was significant to Maitland. "We remembered the 13 men from the Maitland area who went away and never came home," he said. "The Boer War is commonly known as the first time Australian soldiers went away as a combined force. Prior to that men represented their states or territories so it was the first time Australia fought as an amalgamated military force." Mr Bell said it was important to remember the sacrifices made by all servicemen and women. "If we allow these events to drift off into history then we are doing a great disservice to those who fought and died," he said. "We should remember so we don't walk down that path again as well as celebrate the heroic deeds on our part and the comfort of lifestyle we have today." 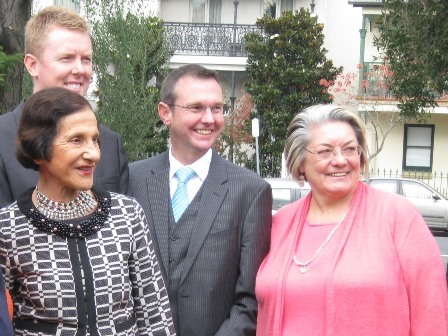 The service was attended by Joel Fitzgibbon, Federal Member for Hunter and Shadow Minister for Agriculture, as well as the Mayor of Maitland, Mr Peter Blackmore. Photo right shows Rae Williams with her grandson Azland Askew, who's shown wearing his great-great-great Uncle Osborne Chilcott's WWI medals - who fought in the Boer War with the NSW Lancers prior to volunteering again for World War 1. 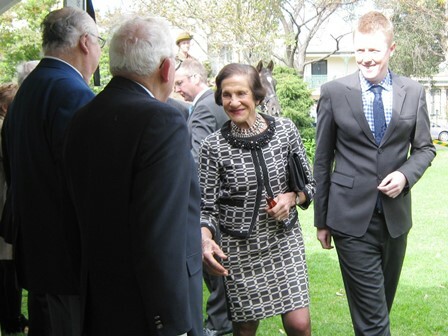 The 2014 Boer War Commemoration in Victoria began on Wednesday 21st May with a reception for First Generation descendants (sons and daughters) of Boer War veterans, hosted by the Victorian RSL at ANZAC House. This was a fitting forerunner to a wonderful day at the Melbourne Shrine of Remembrance on Sunday 25th May, when the annual Boer War Day service was conducted. The Head Cadets, Reserves and Employer Support Division Major General lain Spence, CSC, RFD delivered the commemoration oration to the audience that included 22 distinguished guests. Messages from the Governor General and the Chief of the Defence Force were read and The Hon Nick Wakeling, Minister for Higher Education, whose great grandfather served at the Defence of Elands River, read a message from Victorian Premier Dr. Denis Napthine. He also read a letter from his forebear sent to his family during the Boer War. This was followed by a message from the Lord Mayor of Melbourne Councillor Robert Doyle. The march by descendants and supporters to the Eternal Flame was led by 12 mounted horsemen from the Creswick Light Horse group, supported by the very colourful Rats of Tobruk Memorial Pipes and Drums. This activity provided a great display and was much appreciated by the many spectators. The Australian Great War Association also participated together with the Re-enactment Society of Australia who provided the customary 3 shot cannon salute to conclude the service. A prominent contribution was made by Scouts and Guides from a number of country and metropolitan groups. One hundred and forty seven attended the service in uniform - over 50 more than last year which was appropriate since the Defence and Relief of Mafeking were special themes for 2014. Despite the best efforts of the Shrine administrative staff, the extensive site works presently underway rendered the internal facilities of the Shrine unavailable for the usual post service refreshments. Organisers were very grateful that the Salvation Army was able to step into the breach and provide a much a appreciated alternative on the lawns beside Birdwood Avenue. Although the outlook early was somewhat gloomy, the weather turned out bright and sunny ensuring the overall success of a wonderful day - one that will be pleasurably remembered by all that participated. Mosman Boer War Day was held at 11:00 hr, 6 June. Torrential rain forced a change of venue from the Cenotaph to a nearby hall. Col Rob Shoebridge delivered the Commemoration Address. CLICK HERE to download. 20 people attended with Cr Roy Bendall, Deputy Mayor of Mosman, read the Commemoration of the Fallen. Fr David Strong SJ recited the payers and gave the benediction replacing Monsignor Eugene Harley who was in hospital for minor surgery. On Sunday 1 June 2014, the Nowra RSL Sub-Branch was pleased to hold it's 4th Boer War Day at the Boer War Memorial in Rauch Park in Nowra. Despite the atrocious weather, the number of people who came out for the service was more than in the past years. We estimate there were about 60 people in attendance. The address was given by the commanding officer of HMAS Albatross, Captain Simon Bateman RAN, with the commanding officers from HMAS Creswell and the Parachute Training School as well as a number of state and federal politicians in attendance. There were also representatives from sub-branches and other ESO's and quite a number of Boer War Veteran descendants. Despite the inclement weather, the service was a great success and all who attended are looking forward to the service next year. The WA Boer War Memorial Committee today conducted the 112th anniversary of the signing of the Vereeniging Peace Accords in cool and overcast contentions at the South African War Memorial in Kings Park. A crowd of around 150 people (plus a number of curious by-passers) attended. Among our VIP attendees was Senator the Hon Mathias Cormann MP-Minister for Finance and the Hon Melisa Parke MP, Member for Fremantle, State Government MLC the Hon Peter Katsambanis MLC represented the Premier and the Hon Paul Papalia CSC, MLC represented the Opposition. The ADF was represented by Captain Angela Bond RAN, CO Fleet Base West, Lieutenant Mark Timoney, 13 Bde and Wing Cmdr. Turner, RAAF. We are pleased to say that New Zealand was strongly represented on the day by the Hon Consul, Chris Ellison who laid a wreath on behalf of the NZG, Lieutenant Commander Colleen Smith RNZN who laid a wreath on behalf of the NZDF and our ever faithful Peter Ramsay BEM, laying one on behalf of the RNZRSA. The NZ in ANZAC was not missing in action on this occasion. Not to be left out of the naval triumvirate was Commander John Farrington, RN representing Her Majesty's Armed Forces. Pretty solid representation from three Commonwealth navies. The catafalque party was provided by Bob Wise and his WW-1 History re-enactment group, The Coastals Pipe Band, provided the music and the bugler was provided by 51 ACU Swan Regiment Drums and Pipes. 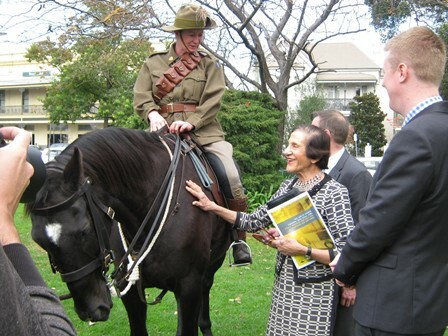 Phil Sullivan and War Horse Gee Jay from the 10th Light Horse Memorial Troop served to remind us of the role that horses have played in our military history and heritage. (10 LH Regt as the lineal descendants of the Western Australia Mounted Infantry have south Africa among their battle Honours). We again enjoyed the services of Group Captain, Dr Mike Galvin RFD as our MC and the Reverend John Dunn as our chaplain. 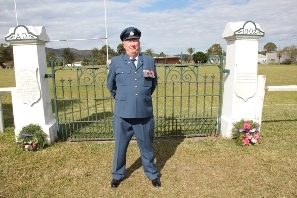 John has an RAAF background and provided well founded and all-encompassing prayers that promoted the reconciliation intent of the service with sincerity and conviction. Brigadier Phil White AM RFD was our keynote speaker. Phil is a former 13 Bde Commander and is currently Honorary Colonel of 10 LH. He is a High School Principal and History Teacher. His speech well reflected his proficiency in both the Professions. There were two short addresses from the WA Boer War Memorial Committee Members. Historian John Sweetman spoke about 1WAMI's first action near Colesburg on 9th February 1900. He was a member of the MHS and RAAHS team which placed a centennial plaque on the Kopje called West Australia Hill. A Boer perspective address was delivered by Mr Brian Ross. He is the Grandson of Commandant George Ross. Our Director of Music and choral arrangements was Ms Moira Wilson who along with three others from her sextet were all dressed in nurses uniforms of the era, the other two member being males, were not similarly attired. They gave sterling service on the day. CLICK HERE to download the Western Australian Governor's message. 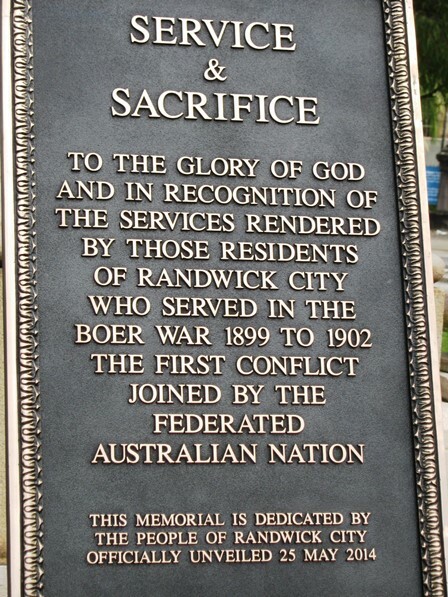 The City of Randwick held a Boer War Commemoration Service today at the memorial at High Cross Park, Randwick was a great success. 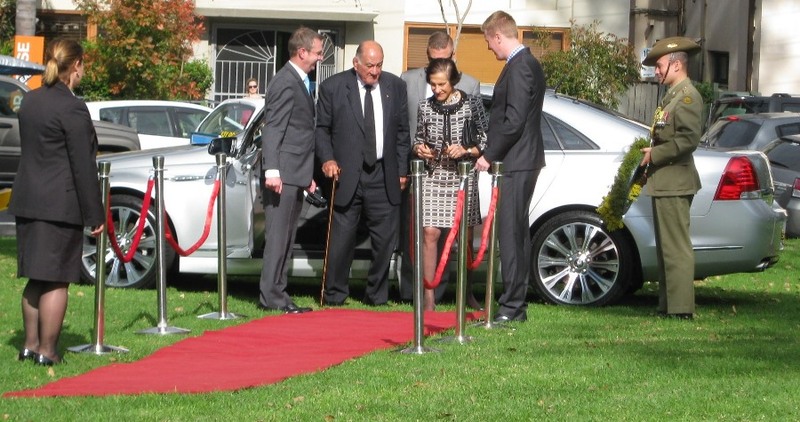 About 200 people watched Her Excellency unveil a Boer War Memorial plaque for the Memorial. David Deasey, John Haynes, John Neenan and Barbara O'Keefe were in attendance. In addition a number of descendants and supporters so lots of BW ties present. Two new descendants who we did not have on board were identified and signed them up. David Deasey spoke briefly on the war and our project. St Marys RSL Sub-Branch held its annual Boer War Commemoration Service this morning at our Guns Cenotaph and attended by 56 interested persons including local Mayor, Federal and State (2) members, Patrons and members of the St Marys RSL Sub-Branch, and local community groups. Our Catafalque Party comprised students from Colyton High School Trade School and our two (Banjo Paterson) poems were read by a Colyton student and a local Army Cadet. 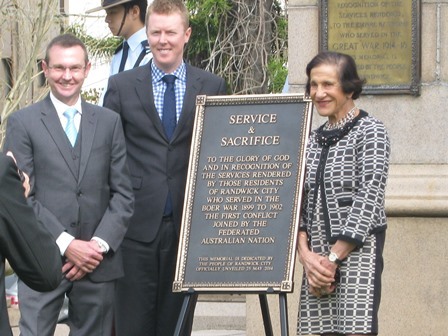 Her Excellency, Prof Marie Bashir AC CVO delivered the Prologue and the commemorative address was given by Major-General Ian Spence CSC RFD, Head Cadet Reserve and Employer Support Division. The national anthem was led by a descendant Mrs Catherine Bouchier. We were pleased to have two Sydney students participating, Gladys Lai from Sydney Girls High School who read the Ode and Cadet Sgt Declan McGuinness AAFC, Sydney Grammar School read Banjo Paterson's poem The Song of the Federation. The pipe band of the Scots College Sydney played for the assembled audience. Wreaths were laid by a number of dignitaries including the Governor, General Spence, Ms Bronwyn Bishop, MP, Speaker of the House of Representatives, Mr Philip Ruddock MP representing the Prime Minister, Mr Matt Thistlewaite MP representing the Leader of the Federal opposition, Mr Charlie Lynn MP Parliamentary Secretary for Veterans Affairs NSW, Ms Amanda Fazio MP representing the Leader of the State Opposition and Cllr Irene Doutney, Sydney City Council. Representatives from all three services, the RSL, war widows, other service organisations and descendants all laid wreaths. The service took place at the Three Springs Memorial in the Jack Thorpe Gardens at 11:45 hrs, Sunday 25 of May. Portion of a letter written by 61 F J Morgan 4WAMI to his brother Steve in September 1900 was read as part of the Service.